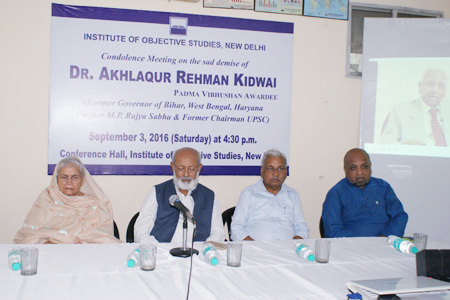 The Institute of Objective Studies held a condolence meeting at its conference hall on September 3, 2016 to mourn the death of the former governor of Bihar, West Bengal and Haryana and the ex-chairman of the Union Public Service Commission, and a recipient of the prestigious civilian honour, the Padma Vibhushan, Dr. Akhlaqur Rehman Kidwai. 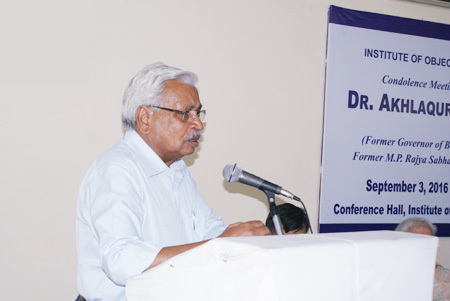 Paying glowing tributes to the memory of Dr. Kidwai, the Chairman of IOS, Dr. M. Manzoor Alam recalled his valuable services to society and state. He said that Dr. Kidwai was a strategist and a planner who proved that devotion to duty was key to success. He announced that IOS would discharge its moral duty to bring to light the multi-faceted personality of Dr. Kidwai. He urged Dr Kidwai’s close family members to do their bit by establishing a foundation in his name to perpetuate his memory. He insisted that since Dr. Kidwai had an unbounded interest in science, a scholarship in science could be instituted in his name. He also suggested that a book on his life and works should be brought out for the younger generation to take inspiration from him. Dr. A.R. Kidwai’s son, Monis Kidwai remarked that he always saw his father working since his childhood. He said that Dr. Kidwai’s decision to prepare the UPSC for conducting the Civil Services examinations in all the 14 languages recognised by the Indian Constitution along with English was a challenging task which he successfully performed. It was another feather in his cap which he achieved by dint of sheer labour and firm conviction. 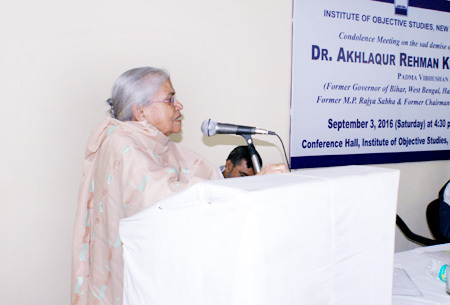 Dr. Kidwai’s sister Najma Rizvi said that he always underlined the importance of education. He wanted every child including the Muslim child, to receive education as it was the spring-board for success in life. She remembered that Dr. Kidwai used to say that positive thinking was essential for achieving a goal. Dr. Abshar Ahmad, Irfan Kidwai, Rafi Ahsan Rizvi, Dr. Syed Md. Abbas, Azmat Husain Khan and Mirza Shamsi Beg also expressed their views on the occasion. Earlier, Maulana Abdullah Tariq recited from the Quranic verse, Al-Baqarah with its Urdu translation. 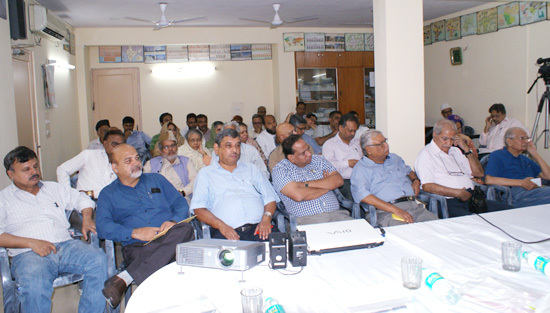 The proceedings were conducted by Dr. Nakhat Husain Nadwi. A good number of Dr. Kidwai’s admirers, university teachers, research scholars, prominent citizens, including Prof. Ishtiyaque Danish of Hamdard University, Prof. Hasina Hashiya and Dr. Eqbal Husain of Jamia Millia Islamia, Dr. Tariq Ashraf, Prof. M. Irfan Alam, Taufiqur Rahman Kidwai, Aqueel Khan, Saba Kidwai, Amina Kidwai, Dr. Taazim Kidwai, Rehana Kidwai, Dr. Zeenat Kidwai, Syed Tahir Ali, Syed Shadab Ahmed, Iqbal Husain, Safi Akhtar, Khalid Husain Nadwi and Waseem Ahmad attended the condolence meeting.